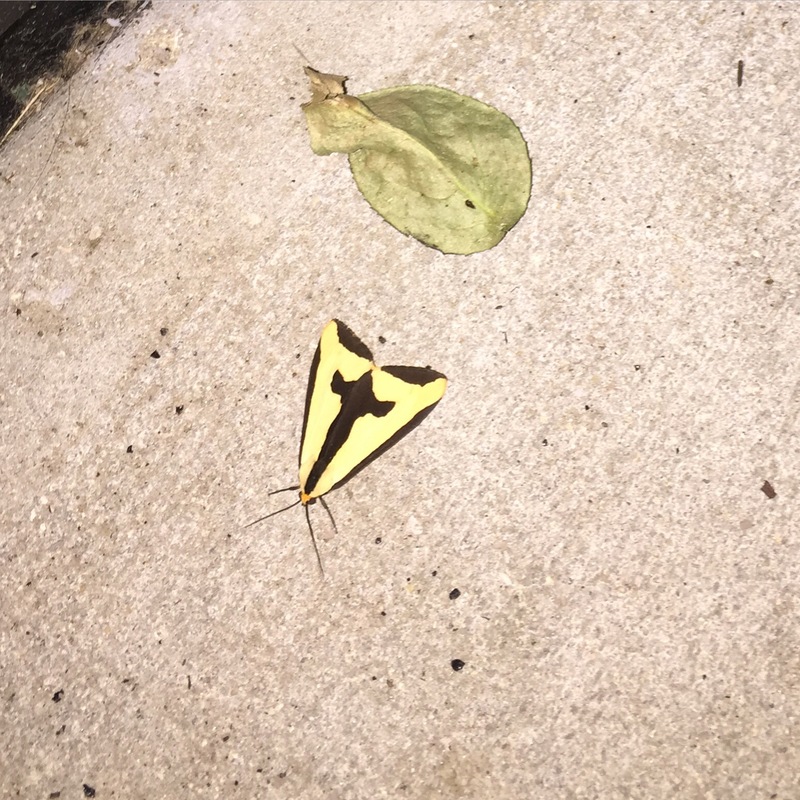 ^ A moth-type creature with a cross on its back on the steps of my apartment building. Google tells me its nickname is “the Jesus moth.” Aptly so. I’ve never seen a Jesus moth until just now, coming home after hours of Boston traffic and feeling sorry for myself despite an otherwise decent day. Time to change my perspective before I miss out on the good stuff. No, it’s not a dramatic Nicholas Sparks novel. It’s just what happened yesterday. I’ve been waging an epic battle against the “Hormonal Hell Highs”- that thing that happens for the younger female crowd once a month and is emotionally and physically draining, diabetes aside. But then diabetes hears the terms “emotionally and physically draining,” and it is all about joining the party. It’s diabetes. That’s what it does. It’s just a fact. If there were a diabetes Tampax commercial, it would show a bunch of insulin-pump-wearing, happy women prancing around the neighborhood with picture-perfect CGM graphs. Let’s get with the program here: That isn’t reality for most of us. Not many things are as frustrating as doing everything you’re supposed to do- checking your blood sugar often, increasing boluses, raising basal rates, trying to keep Grumpysaurus Dex in its lair, and more- and seeing that steady yellow line indicating “high” on the CGM for hours and days on end. Some months are better than others, and in typical diabetes fashion, what works one month rarely applies to the “hormone play date” of the next month. For someone who is accustomed to working hard and seeing that hard work pay off in terms of job opportunities, GPA, and other objective measures of “success,” it has been a tough pill to swallow- rather, a painful injection of insulin to take- to make peace with the fact that I am trying my best and those blood sugar numbers, although elevated, are the best that I can do right now. I am not rolling over and letting the diabetes waves swallow me. Instead, I am throwing on the insulin life preserver and trying to stay afloat until the hormonal college mixer going on inside of my body quiets down. It is okay to have those moments of hormone-fueled tears, but I still have to ride the diabetes wave and get back to shore safely. Yesterday at work, many of us participated in certification testing to measure how well we understand the medical and legal aspects of our job. It is about as un-fun as it sounds, but it has to be done. We all filed into the office like nervous teenagers before the SATs, coffees freshly brewed and pencils newly-sharpened. The test was divided into morning and afternoon sessions. After finishing the first half of the test, we had an extended lunch break with a heavy emphasis on coffee-refueling at the local shop. My first word upon leaving the test-taking haze was not “coffee,” though. Instead, it was “LANTUS.” I went to the bathroom, jabbed the needle into my backside, and felt immediate relief as I watched the life-sustaining insulin leave the pen and enter my body. Must. have. insulin. “Work Mom” texted me about getting coffee, but I neglected to respond due to the Lantus shooting up session. (The Millennials crowd truly cherishes our connections with “Work Moms,” those kind souls who keep a watchful eye on the young professionals in the office.) My Work Mom later found me in the coffee shop, where she knew I would be all along. “Do you want to get out of here and go for a walk or something?” I asked. And so we strolled through Providence until we found the perfect resting place: Adirondack chairs in the middle of a local college campus. We parked ourselves there and chatted about anything and everything, never pausing while I checked my blood sugar or injected Humalog into my abdomen. Work Mom’s empathetic presence in the Adirondack chair indicated that she understood what I needed to do and that diabetes did not have to interrupt anything in that immediate moment. Amen. Here’s where I’ll sound like Nicholas Sparks in a corny, yet heartfelt, manner: How often do we get to pause and enjoy those little moments, removed from the hullabaloo of the world around us? As college kids bustled by our Adirondack chairs on their way to the dorms, we simply soaked up the sunshine and the good company of one another. I am not happy that diabetes has run my patience rather thin during this time of the month. But I am thankful that this time around, I do not have guilt about how I have handled the highs and the lows. It does not mean that I have failed if I feel like crap sometimes. I am trying my best. Right now that means being present in the moment, sipping on coffee in the Adirondack chairs. Thanks for the perspective, Work Mom. In May I was contacted by NuGo Nutrition in regards to sampling and reviewing their diabetes-friendly NuGo Slim bars. I respect companies like NuGo Nutrition which value the opinions of their potential consumers enough to reach out and interact with us. So I thought, Sure, why not? Chocolate-covered bars that are supposedly well-liked by the body? Yum! The only way to know for sure was to actually taste the bars and see for myself. NuGo Nutrition sent me a box of Nugo Slim bars with various flavor samples. Normally, grocery-store-bought nutrition bars collect dust in my kitchen cabinets. As for the Nugo Slim bars, though, I liked each flavor and consumed all of the samples with surprising speed. I plan on purchasing a supply the next time I am near my local Whole Foods store. For locations nearby which sell NuGo products, you can use NuGo Nutrition’s online search feature (see here). My #doc friend, Laddie, over at testguessandgo.com also reviewed these bars, and if you would like to read more: please see here. NuGo Slim bars got the “Ally A+” nod of approval because they performed as they were advertised. They were yummy, they did not spike my blood sugar, and they, in fact, kept my blood sugar stable when I needed a little boost of carbohydrates through out the day or night. Being back on multiple daily injections has proven to be a challenge overnight, simply because once that Lantus morning dose of insulin is in you, it’s in you for the whole day and night. Historically, whether on the insulin pump or on shots, my blood sugar tends to drop quite a bit over the course of the night. If I was going into bedtime with a lower blood sugar value than I would normally like to see (knowing that I will generally drop more overnight), by eating half of a Nugo Slim bar before bed, I kept the line on my CGM graph stable and pretty as I slept peacefully. During a visit to Newport, Rhode Island, with one of my siblings and some friends, we were more active than I originally anticipated. Again, being back on multiple daily injections, this situation is a bit more complicated because I cannot simply reduce my basal, which was already injected into me for the day, like insulin pumpers can do with temporary pump basals. I needed a snack that would keep my blood sugar at the healthy range that it was in, without spiking me too high while also preventing the impending low due to exercise. NuGo Slim bars got the job done, and I was able to enjoy my time with my friends without diabetes interrupting our day. The healthy ingredients, low sugar, moderate amounts of protein and fiber which helped stabilize my blood sugar, low net carbs, and real dark chocolate in NuGo Slim bars were a winning combination for me. While I disclose that I received sample products from NuGo Nutrition, the opinion presented here is my own. I am sharing my thoughts with the #doc because I believe that NuGo Slim bars offer a high-quality snack option for diabetics. It has been almost one month since I took a step back from blogging. I can’t quite say the same for live-tweeting my stream of consciousness, but I did my best to avoid reading feverishly about diabetes technology as promised. My tiny blogosphere roar does not make the world go ’round. But, for me- and hopefully for the people who read my blog on occasion- Very Light, No Sugar will always be my own little piece of the larger diabetes puzzle. Blogging is how I shed light on the thoughts that have bounced around in my head for over 24 years of living with type one diabetes. Reading others’ blogs has been empowering and unifying; many of those same thoughts bounce around in other heads, too. Putting my feelings on (virtual) paper makes them real- a part of our shared experience of diabetes. Changing up the blog post pace allowed me to reexamine why I chose to blog in the first place. By taking a step back, I was able to let others step in. Before the mini-hiatus, I probably did not realize just how much I needed those little moments with big meanings because I was caught in an overwhelmed, overtired haze. Emailing back and forth with various #doc buddies who offered unconditional support and understanding, paying more attention to the humorous side of diabetes via the Twitter and Facebook jokesters, and spending a few days on Cape Cod with my family allowed me to hit the figurative “reset” button. And let me tell you, the “reset” button is more refreshing than pounding the “snooze” alarm three times each morning. It’s good to be back, even if only at “training wheels” pace for the time-being. Drink your coffee and take this survey, please! ***Update: The survey is now closed. Thank you so much to everyone who participated and/or helped to spread the word!